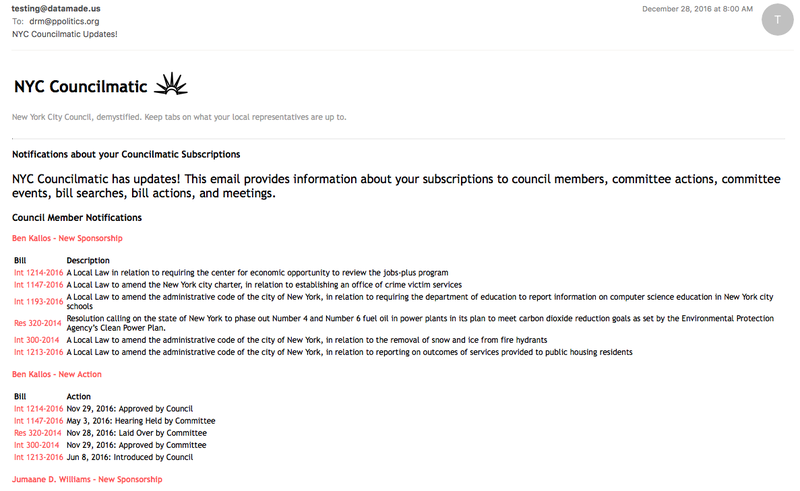 Now, you can subscribe to free email updates about everything in the NYC Council. It’s easy to stay informed about local issues and share timely info. 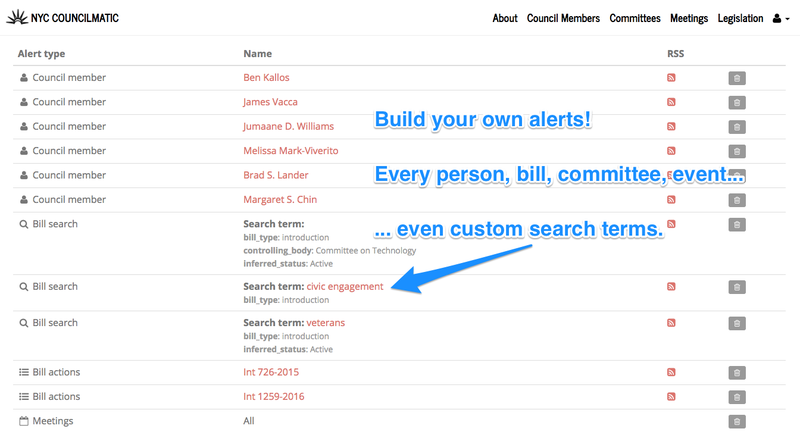 Get daily email updates about every council member, legislative item, committee hearings, public meeting schedules — even custom search terms. 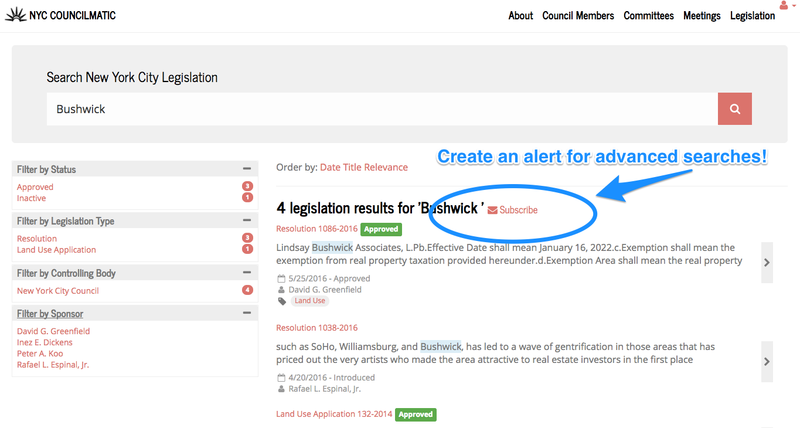 To start tracking, head to NYC Councilmatic. 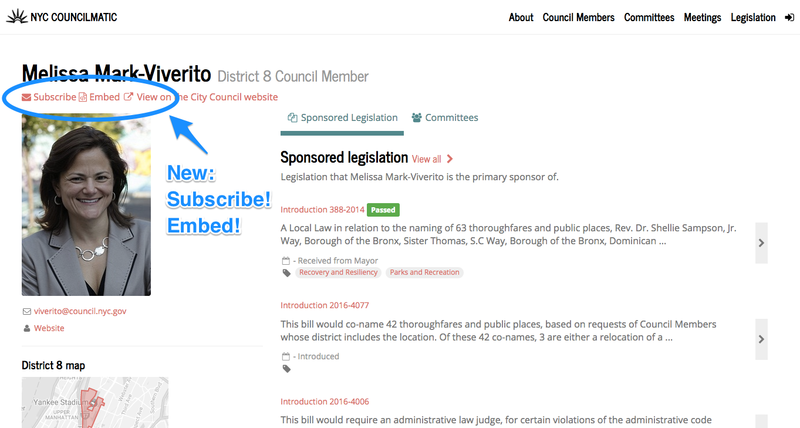 Visit any page — e.g., your Council member — and see the two new options: “Subscribe” and “Embed”. Get in touch with questions, feedback, or to let us know what you’re tracking in NYC Council — simply email: info at councilmatic.org. NYC’s local non-profit news site Gotham Gazette will also use new tracking features & embeddable widget over the course of this election year, with more local media partners to be announced. Finally, stay up-to-date about bills on the agenda for committee hearings, and post your comments for council offices — creating a feedback loop of local civic engagement. These features have never before been available to the public in a free website, launching first in the incredible NYC. Some background from Catherine Bracy at PdF conference in 2015 — now all these features exist for wider accessibility, info-sharing and online participation, in open-source code that’s free to the public and built as a non-profit public service. 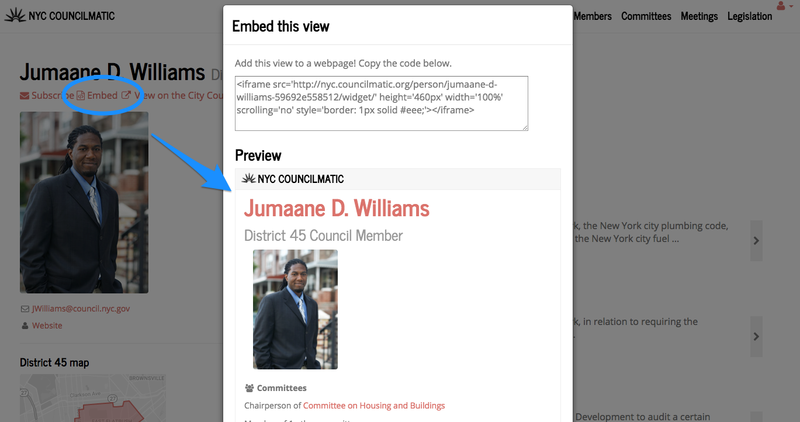 NYC Councilmatic is a project of our 501(c)3 non-profit Participatory Politics Foundation, supported by a 2015–2016 charitable grant from the Rita Allen Foundation for greater public dialogue (Rita Allen also funded the development of these new email alert features). I’m based here in NYC, working out of Civic Hall, and am actively seeking funding support to maintain NYC Councilmatic during this 2017 city-wide election year — get in touch to chat more, email: info at councilmatic dot org. Councilmatic’s tech leads are DataMade, the stellar civic technology company based in Chicago who maintain the Chicago version of Councilmatic. Get in touch to discuss options for bringing a version of Councilmatic to your city or wider area, email: info at councilmatic .org. Open-source (on GitHub), with unique open city government data. Follow me here on Medium for more descriptions of how to leave public comments in Disqus forums on the bottom of any NYC Councilmatic legislation page. NYC Council offices and government staffers, happy to chat in more detail, get in touch by simply emailing me — we’re working to connect more constituents to your district offices for productive local engagement. Contact us anytime, and help us spread the word. New: @readsludge, investigative journalism on money in politics, a newsroom on @join_civil. Previously: OpenCongress, AskThem, Councilmatic.